The Dell XPS Tower Desktop PC for business has amazing power and expandability capabilities. This has all the technology you will need to keep your employees productive in the office. It has great graphics, top of the line Intel processor and amazing storage options, all for a price that you cannot argue with because you will have a high performance desktop without breaking your wallet. We usually have XPS 8910 and 8920 coupon codes and discounts to pass on to you. If there are none available at this time, check back soon. The new XPS 8920 comes with the Intel® Optane™ memory accelerated hard drives and 7th Gen Intel processors just to speed things up a bit. The XPS 8910 tower offers a choice of two of the most powerful 6th generation Intel processors with this PC; the Intel© Core™ i7 or the Intel Core i5. You could get amazing memory too, with up to 16 gigabytes of Dual Channel DDR3 SDRAM. Pair those two with up to a 2 terabytes of storage on the hard drive. With all of that power and storage, this true business desktop will satisfy even the most demanding business applications. With the option of a Blu-ray DVD drive and powerful graphic options, you can have a business powerhouse desktop. Don’t worry about not being able to play some of your media because it has enough ports to be able to access all of your media. All these high-tech parts and you don’t even have to worry about a thing with Dell’s security and safety features such as Dell backup and Recovery manager. 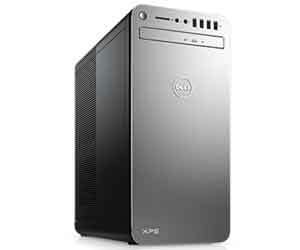 Therefore, if you have the need for a high performance desktop that you can use for work or play, then this Dell XPS Tower Business Desktop PC is the one for you. This is an affordable PC too, especially with the XPS 8920 coupon codes and discounts that we have to offer. Check out all of the XPS desktop deals and compare the different models to find the correct one to suit your business needs, Shop Now!